The Emperor Penguin is the biggest living penguin species. It lives in Antarctica. The temperature there can go as low as -60C (-76F). The males weigh more than the females. 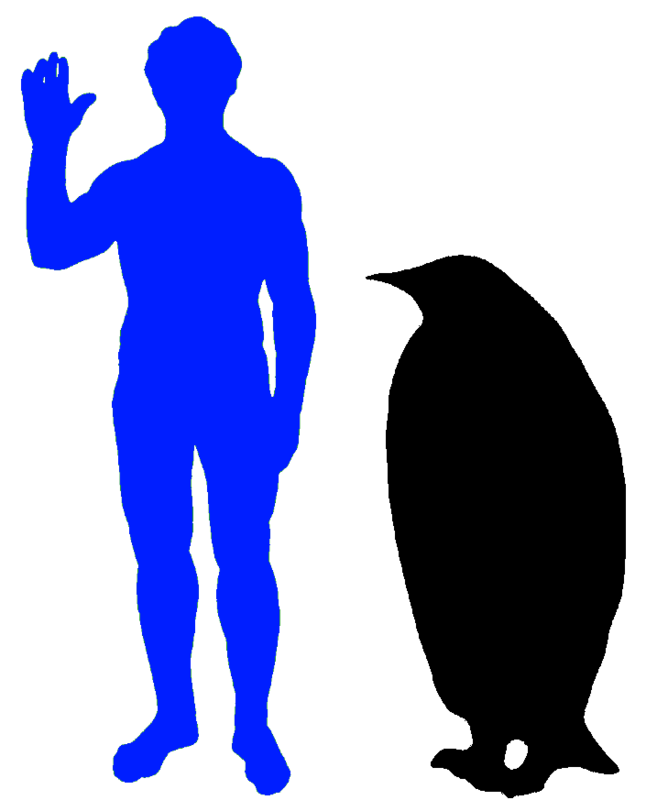 They are about 120cm (48in) tall and weigh between 22 to 45 kg (49 to 99lb). Their head, chin, throat, back, back part of the flippers and tail are black. The underparts of their wings and belly are white. Their upper breast is pale-orange and their ear patches are bright yellow. Emperor Penguin chick is normally covered with silver-grey feathers and has a black head and white mask. Chicks weigh around 315g (11 oz) after hatching. They find each other in the big colonies with their calls. The hero of the movie Happy Feet was an Emperor Penguin. Emperor Penguins are birds which cannot fly, but they swim very well. They have a streamlined body, wings which are stiff and flat like flippers, shiny, waterproof feathers which keep their skin dry and webbed feet which they use for swimming. They spend their entire lives in the icy cold of the Antarctic ice and the surrounding seas. The Emperor Penguin’s tongue has spikes that face backwards, to stop fish from getting away once they are caught. They eat mainly fish, but sometimes also eat krill and squid. They are able to go underwater for up 18 minutes while looking for food in the icy cold waters. They will quite often dive to a depth of 535 metres (1,755 feet). Isn’t that amazing? They are the deepest and longest divers among all birds. Since they are great divers, they have bones which are solid and not hollow, so they can withstand the pressure under the deep sea. While diving, they are able to use less oxygen. Their heart rate will be as low as 15-20 beats per minute. This allows them to dive longer and deeper. They are able to swim at speeds between 6-9 km per hour (4-6 mph). On the land, they will alternate between walking with swaying gait and sliding on their belly. They are propelled by their small feet and wing-like flippers. The Emperor Penguin only has one mate each year. They are very faithful. 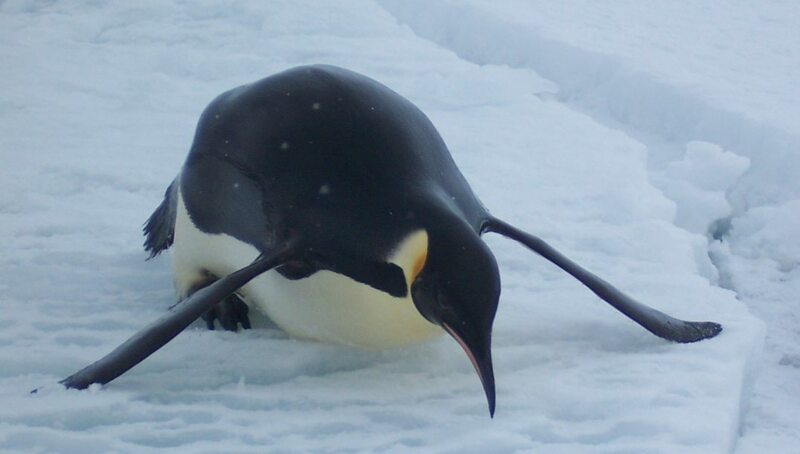 Unlike most birds, which lay their eggs during spring, the super heroine Emperor Penguin chooses to lay her eggs during the extreme cold of the Antarctic winter. They are the only bird species that do that! Aren’t they crazy? The air temperature can reach -40C (-40F) and wind speeds can reach over 140km/h (90 mph). The water temperature is about -2C (31 F) which is much lower than the Emperor Penguin’s average body temperature of 39C (102F). When the mother penguin transfers her egg to her husband to keep it warm, she must be very careful not to drop it. If she does, the chick inside the egg will die because the egg is not able to withstand the freezing temperatures on the icy ground, not even for a short time. 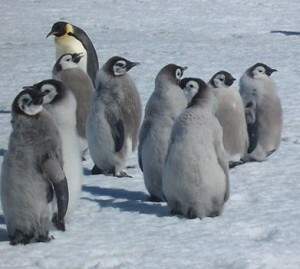 Emperor Penguin’s feathers provide 80-90% of its insulation. They have the highest feather density of any bird species, about 15 feathers per square centimetre (100 per square inch). Apart from that there is a layer of air within the smooth layer of feathers which helps to insulate them even more. They have 3 cm (1.2 inch) thick layer of fat under their skin which keeps them even more warm and cosy. On top of that, mum and dad will have to trek for 50 to 120km (31-75 miles) over the ice to look for a suitable place to build their next, sheltered from the icy cold wind. The mother Emperor Penguin will lay a single egg at one time and then she will leave the egg for the father to babysit. She will then head off on a hunting trip. At times, she may have to travel between 80–1,500 km (50–900 miles) per trip just to reach open water. There she can find fish, squid and other marine small animals to eat. In the meantime, the dad will become a stay-at-home-father looking after just one egg for about two months, not eating anything or moving at all. Unlike most birds, the dad will not sit on its egg to hatch it. It will stand and balance the egg on its feet. It will also cover its egg with its warm layer of feathered skin which is called the brood pouch. The male will stand in the wintery cold weather for the whole 2 months without eating until the egg is hatched. What a noble dad! The eggs is small and it has quite a thick shell to make sure that it does not break easily. After the egg hatches, the young chick will stay in the brood pouch until it is able to stay warm without help. By the time mother returns from her hunting trip, the father will have lost about 12 kg (26lb). I think the father Emperor Penguin should be awarded the title of “Father of The Year” for having to stand still and not eat anything for 2 months in the harsh cold weather of Antarctica. When the mother returns she will vomit out food for her baby. The food has been stored in her stomach. The hungry father then gets his chance to trek over the ice to look for food. Mum and dad will take turns to hunt and to care for the chick in the colony. They usually live to about 20 years in the wild and some to about 50 years of age. The Emperor Penguins are intelligent enough to help each other to survive in the extreme cold by all huddling together to keep each other warm and cosy. There will be about ten to several hundred of penguins with each bird leaning forward on another bird. They will form a circle and they will take turns standing in the middle of the circle to get away from the icy cold temperature and wind. Their predators are birds and aquatic mammals. The Southern Giant Petrel seabird is the most common land predator for the Emperor Penguin chicks. For example, a third of the chicks deaths in some colonies is caused by the Southern Giant Petrel. Apart from killing the live ones, these seabirds also eat dead Emperor Penguins. Another land predator is the South Polar Skua seabird. However, it mainly looks for dead chicks because the live ones are too large to be killed. Some aquatic mammals which hunt Emperor Penguins are the Leopard Seal and the Orca (Killer Whale). If mum or dad dies or is killed during the breeding season, the surviving parent will, sadly, have no choice but to abandon its eggs or chicks, and go hunting for food in the sea before it starves. I just found your lovely website! A lot of good information! 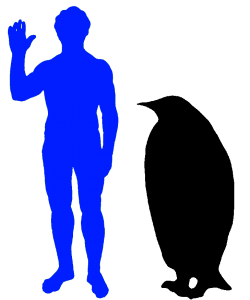 But the size comparsion with a human is too much out of proportion! 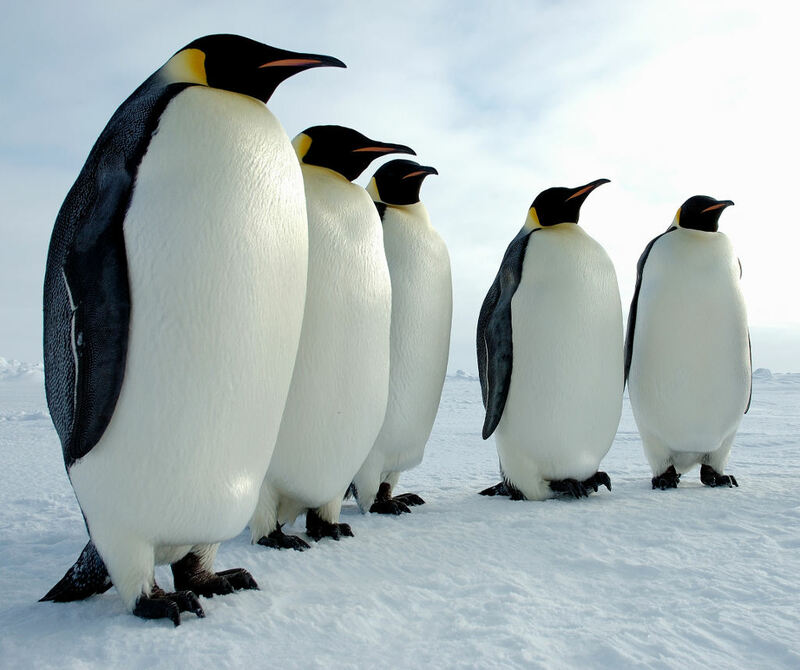 Emperor penguins are the largest in their family but they are not THAT large! The one shown here looks more like one of the huge penguins that became extinct a few hundre thousand years ago.